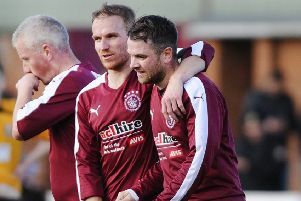 Three second half goals gave Linlithgow Rose victory over Highland League Fort William and a place in the second round of the senior Scottish Cup. 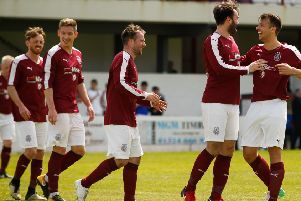 Rose were unable to make the breakthrough in the first half but eventually a goal from Tommy Coyne and late strikes from Robert Sloan and Kyle Turnbull saw them through to an away tie against former junior rivals Beith. The Rose pressed forward right from the whistle and Fort William spent most of the match trying to get out of their own half. Keeper Kulbacki stopped Kevin Watt’s diving header, and then he had an easy hold from Gary Thom’s header. Midway through the half, Coyne’s header from Thom’s cross lacked enough power to trouble the keeper, and a few minutes later, Kulbacki made a great diving save to deny Blair Batchelor, skipper for the day in the absence of Ruari Maclennan. Then a low shot from Thom drifted just wide of the target, before Fort's Wilmshurst was called back and booked by the referee for a foul on Watt seconds before when the referee had played advantage. Just before half time, the keeper made a low save from Coyne’s shot on the turn, and when the half-time whistle sounded, the Rose left the pitch wondering how the scoresheet had remained blank. Fort William had their chance to cause an upset right at the start of the second half when there was a goalmouth scramble but couldn’t take their chance and then McGurk’s overhead kick was saved by Rose keeper Kyle Marley. In the 50th minute Coyne shot over the bar from point blank range, and minutes later, keeper Kulbacki was shown a straight red card for handling the ball outside the box as he tried to dispossess Watt who was through on goal after he was released by Coyne. Hunter was sacrificed for substitute keeper Ligertwood, and immediately the substitute made a great low diving save from Sloan’s free-kick. Rose finally made the breakthrough in the 63rd minute as Coyne brought down and controlled a pass before firing home a low right foot shot. A couple of minutes later, the Rose striker hit the post with a volley from a tight angle, while at the other end, Morrison’s shot went wide. Colin Strickland was unfortunate to see his shot curl past the post and Batchelor’s strike went wide before Ligertwood pulled off a fine save to deny Darren Smith. A somewhat frustrating afternoon for the Rose camp eventually ended with the relief of two goals in the final minute. Sloan fired a great left footed strike into the corner of the net from Strickland’s pass, and a minute later Turnbull fired the ball home from Ronald’s cross.